Why Winter Is a Good Time for Tree Work! Now that the leaves have fallen and the snow is starting to cover the ground, many people are not thinking about their trees as much. We’d like you to know, however, that winter is a great time to work on trees. The months of April to December are usually the busiest months for the tree care industry but winter is a great time to do certain types of tree work. 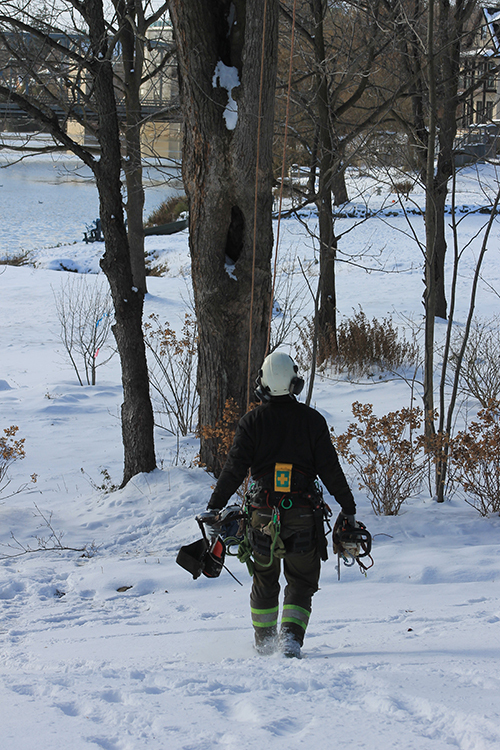 As arborists we really enjoy working in the winter. The snow is beautiful and our chainsaw pants provide a nice insulation in the cold weather! Removals – When the ground is frozen there is less impact on lawns and gardens surrounding the trees being removed. Trees that are dying from disease such as Emerald Ash Borer are great candidates for winter removal so that they don’t become a hazard in the spring when you want to be outside in your backyard. If you have been considering removing a tree in your yard, consider that winter might be the best time to get it done. Forest work – Forestry work such as plantation thinning and trail clearing are ideal for winter. When the ground is frozen there is less risk of damaging the forest floor. If logs are being pulled out of the bush with machinery then there is less chance for ruts being made. Work done in the winter can also ensure that wildlife like birds and small mammals will not be disturbed by work during the nesting season. Pruning – Most trees can benefit from light pruning done during the dormant season. Dormant pruning helps the tree focus its energy effectively come spring. Winter pruning should be done after the coldest days have passed and things are beginning to warm up again. 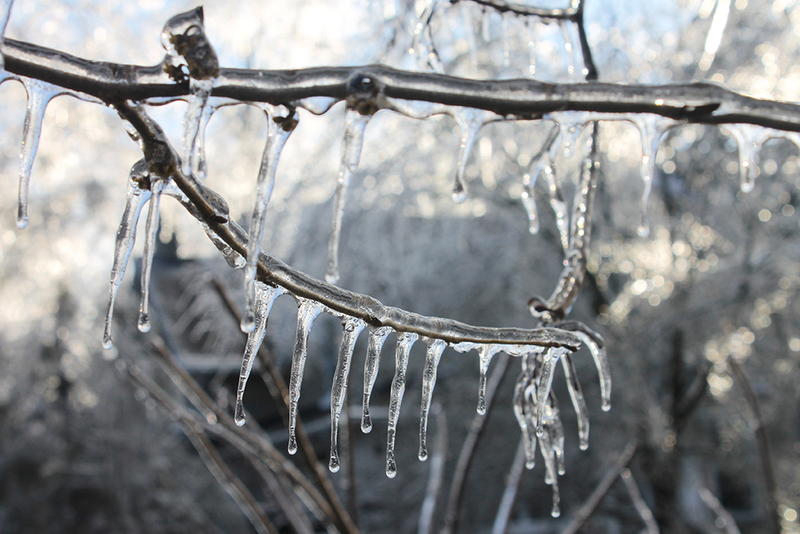 Species like Maple, Walnuts and Birches, may bleed from pruning cuts when the weather warms and sap begins to flow. This is not usually harmful and will stop once the tree leafs out. If a tree has shown signs of stress or disease or was not vigorous in its growth during the previous growing season, it might be better to wait until the tree is just about to leaf out to do any major pruning. Sometimes, even though the tree is stressed you may want to prune it in the winter anyway if there is a risk of the tree being damaged in severe weather due to structural issues or previous storm damage. Some jobs are more appropriate for winter tree work depending on access to the yard. 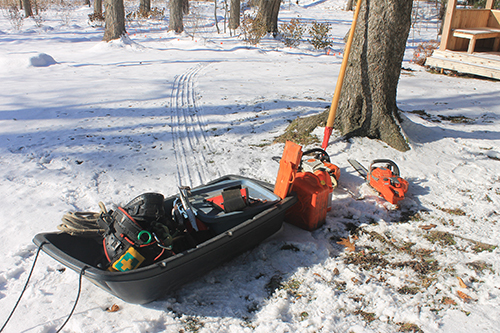 When there is snow on the ground, the use of sleds help us move wood around easily but it some cases we may ask clients to clear us a path to the tree if there has been a large amount of snow. Trees that are over grown, have poor structure or that have been previously damaged in storms may require some pruning to protect the tree from failure during harsh winter weather. During the winter months when the trees have no leaves it is easy to see the structure of the tree of prune the tree appropriately. Preventative maintenance can lower the chances of failure during severe weather. It’s never too early to start taking care of your trees. We always say that pruning a tree before a storm damages it is the most effective way to prevent failure but if severe weather causes a branch to fail or leaves hanging branches in the crown, it is best to deal with it immediately to avoid further damage or risk of injury from falling debris. Please contact us today to discuss your tree removal considerations and needs. It is also helpful to know that we offer winter work discount pricing from January to March. Email us for a free quote at https://baumtreecare.com/free-quote/ or call us at (226) 383-2286.